This comprehensive text covers all the major theories in counseling and psychotherapy along with an emphasis on how to use these theoretical models in clinical practice. 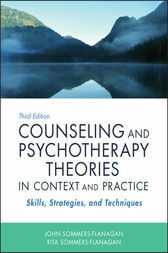 The authors cover the history, key figures, research base, multicultural implications, and practical applications of the following theoretical perspectives: Psychoanalytic, Individual/Adlerian, Existential, Gestalt, Person-Centered, Behavioral, Cognitive-Behavioral, Choice Theory/Reality Therapy, Feminist, Constructive, Family Systems, Multicultural, and Eclectic/Integrative. This text has case examples that bring each theory to life. The entire book has been updated with the latest research and techniques. Pedagogical features include learner objectives, "Putting It in Practice" boxes, questions for reflection, case examples and treatment planning, and chapter summaries. Every theory is examined from cultural, gender/sexual, and spiritual perspectives. The instructor supplement package includes a Respondus test bank, chapter outlines, supplemental lecture ideas, classroom activities, and PowerPoint slides. Video demonstrations corresponding to every major theory and linked to each chapter's contents. In addition, a WPLS course will be available after publication. The Sommers-Flanagan's hands-on, practical approach emphasizes how students and practitioners can apply these theories in real-world practice. Students are empowered to develop theoretically-sound and evidence-based approaches to conducting counseling and psychotherapy. JOHN SOMMERS-FLANAGAN, PHD, is a clinical psychologist and professor of counselor education at the University of Montana. He is a long-time member of both the American Counseling Association (ACA) and the American Psychological Association (APA). RITA SOMMERS-FLANAGAN, PHD, is professor emeritus at the University of Montana. As a clinical psychologist, she has worked with youth, families, couples, and women for many years.